I was predisposed to like BONE TOMAHAWK because a. it’s a Western, and b. it was written and directed by S. Craig Zahler, Western novelist, Western pulp fan, occasional commenter on this blog, and probably the only filmmaker in the business who has expressed a fondness for the work of Ray Nafziger—or who knows who Ray Nafziger was! I was a little concerned because I’d read that it was extremely violent, and so it is, in three or four scenes, but this movie is a lot more than that. 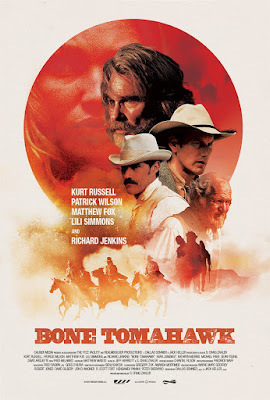 In some ways BONE TOMAHAWK is a classic traditional Western: four men set out in pursuit of a band of Indians who have kidnapped several people from a settlement. This small posse is led by the local sheriff (Kurt Russell) and includes one of his deputies (the great character actor Richard Jenkins), a dandified but dangerous gunman (Matthew Fox), and the cowboy (Patrick Wilson) who’s married to one of the kidnap victims. The grizzled deputy known as Chicory is a wonderful character, pure Western pulp in some ways but with more depth than many pulp characters, and the others are interesting characters, too. We get to know them pretty well, because most of the movie is spent following their pursuit of the Indians. Those Indians are not typical Western movie antagonists, though, and that’s where BONE TOMAHAWK’s more horrific elements come in. They’re cave-dwelling, cannibalistic savages feared and despised by the other tribes in the area. They’re pretty creepy, too, and some of the things they do are where the graphic violence comes in. It’s well-staged, though, as are the more traditional action scenes. Mostly, though, BONE TOMAHAWK is a movie full of fine acting, great dialogue and photography, and a surprising amount of humor in spite of its reputation for being grim and unrelenting. Some people have complained that the pace is slow, but I didn’t really find that to be the case because I was enjoying the characters and what they were saying and doing. I’d love to see Zahler try his hand at a more traditional Western, but that may not be what he’s interested in doing. Whatever it is, though, I’ll definitely be watching because I was really impressed with BONE TOMAHAWK. It’s 1950, and Stan Wade, L.A. PI, is working on his first case: recovering the stolen manuscript of a new Sam Spade novel by Dashiell Hammett. This epic hunt will last for a decade, and before it’s over will involve Humphrey Bogart, Eleanor Roosevelt, Alfred Hitchcock, Mickey Cohen, Robert Bloch, stripper Candy Barr, and a sleazy nightclub owner named Jack Ruby. Will Stan survive to put all the pieces of this crazy-quilt case together? 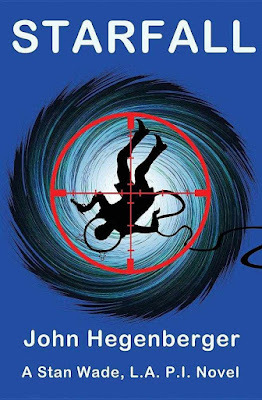 It’s bullets, volcanoes, espionage, romance, humor, double-crosses, and pop culture references galore as Stan Wade races through another fast-moving, action-packed caper. 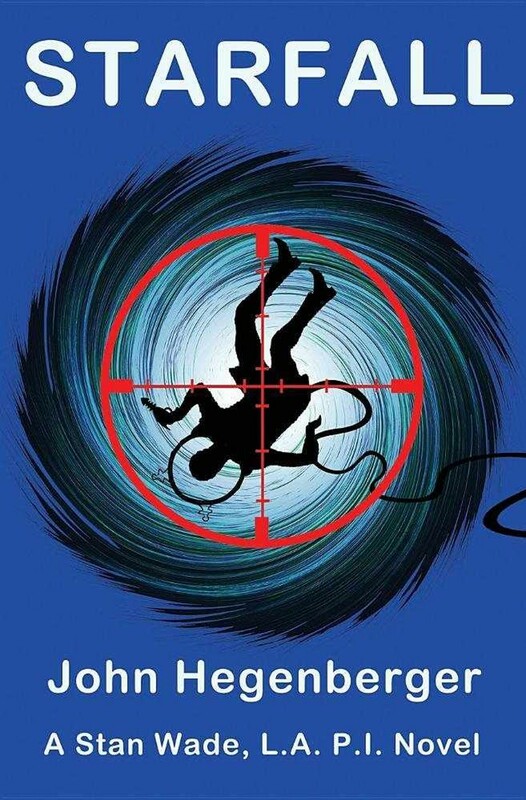 John Hegenberger’s SPADEFALL is the latest entry in one of the best new private eye series in years and pure reading entertainment. Trying to keep up with Stan Wade is some of the most fun you’ll ever have in the pages of a book! 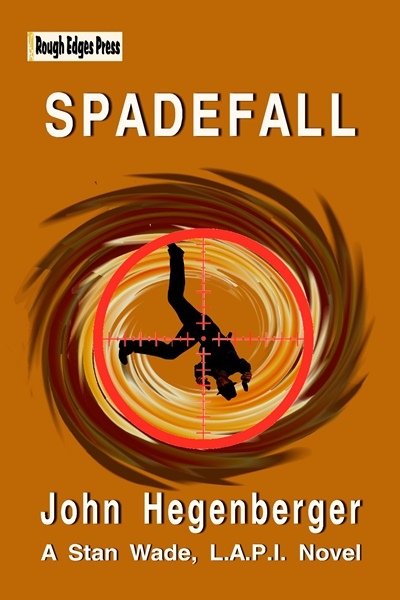 “If you’re looking for non-stop action, along with some humor and surprising twists, give this a try.” – Bill Crider on SPYFALL, the first book in the Stan Wade series. Bergey! Need I say more? 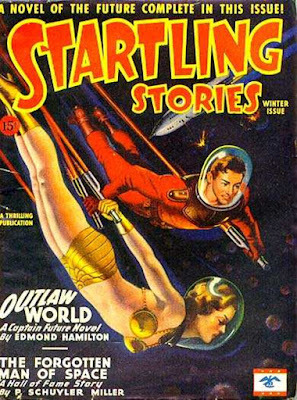 Well, how about the fact that I read Edmond Hamilton's Captain Future novel from this issue, "Outlaw World", in its paperback reprint from Popular Library many years ago. I don't remember anything about it, but I never read a Captain Future novel I didn't like, so I'm sure it was good. 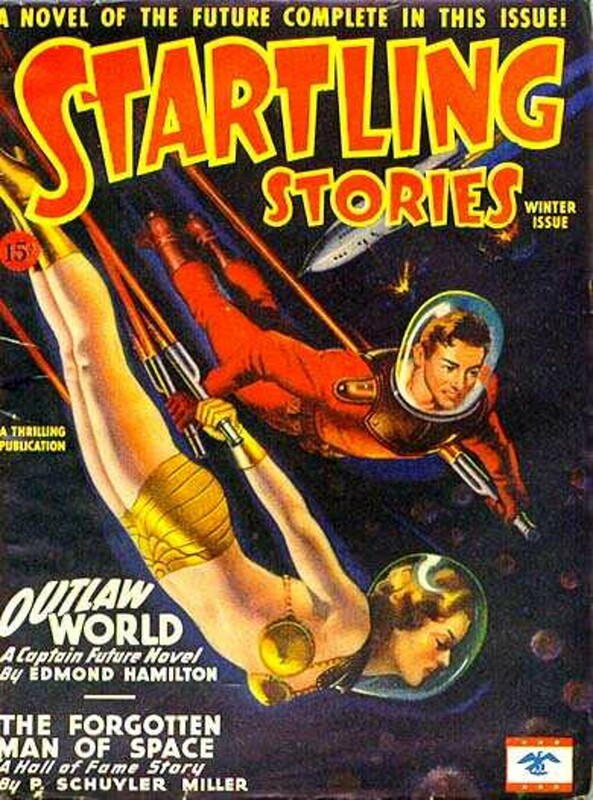 Also in this issue are stories by P. Schuyler Miller (a reprint from the April 1933 issue of WONDER STORIES) and Sam Merwin Jr., who was also the editor of STARTLING STORIES at the time. Miller I've never read, at least that I remember, and I probably should. Merwin, of course, was my mentor during the early days of my career and the first editor to publish a story under my name. 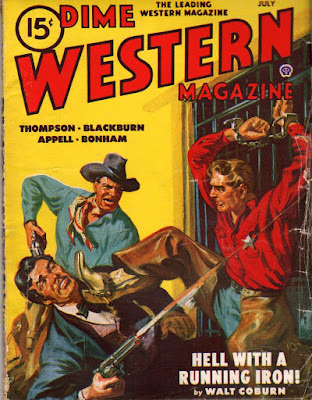 I’ve grown increasingly fond of novellas and short novels as I get older (the result of less time to read and a dwindling attention span, I suspect), so it makes sense I’d like TRIPLE WESTERN, a pulp devoted to them. Recently I pulled the December 1952 issue off my shelves and read it, and as expected, I had a fine time doing so. The scan, as usual, is from the copy I read. The issue leads off with Frank Castle’s “Brothers in Blood”, which is really the only story long enough to be called a novel. I estimate it’s around 40,000 words. It starts off as a standard range war plot, with the villain out to take over the ranch owned by brothers Saul and Hal Baxter. Saul and Hal really don’t get along that well, but they share a determination to hang on to their spread. From that typical opening, Castle brings in some surprises, including some long-buried family secrets reminiscent of Ross Macdonald and a pair of overlapping romantic triangles. His distinctive style, which is really dominant in the Lassiter novels he wrote as Jack Slade, is already somewhat on display with its missing verbs, odd tenses, and abundance of commas. Castle makes it work, though, and the story just races along in very entertaining fashion. I enjoyed this one a lot. Steuart Emery had a long and prolific career in the pulps, dating back to 1919, although he seems to be mostly forgotten today. For the first three decades of his career, he produced primarily war and aviation stories, with a few detective yarns thrown in. By the Fifties, though, he was writing mostly cavalry stories for various Western pulps in the Thrilling Group, like this issue’s novella “Apache Dawn”. I’d read some of Emery’s stories in TEXAS RANGERS and recall liking them, so it’s no surprise I enjoyed this one, too. Emery is a very traditional plotter, so don’t look for many surprises in his stories. “Apache Dawn” makes use of the old “frontier-seasoned officer vs. by-the-book officer from back east” plot, with a romantic triangle thrown in as well. It plays out just about as you’d expect, but Emery writes so well the predictability doesn’t matter much. The numerous battle scenes are excellent, and the beleaguered hero is very likable. There’s a surprisingly good heroine in this story, too, who definitely doesn’t fade into the background as sometimes happens in Western pulp yarns. Overall, “Apache Dawn” is a suspenseful and very effective tale. I was impressed enough I ordered a copy of one of Emery’s air war novels, since I’ve never read anything except his Westerns. About thirty years ago I went on a Luke Short binge, reading a couple dozen of his novels in fairly short order. These days I still read one now and then, or one of his pulp novellas like “Lead Won’t Lie” in this issue. It’s a reprint from the September 9, 1939 issue of WESTERN STORY. Short, whose real name was Frederick Glidden, usually had a hardboiled tone to his stories, and this one is no different. Jim Hutchins is the only survivor of a violent frontier feud, and when he drifts to a different part of the country and starts a ranch in partnership with another man, trouble soon crops up again when Jim’s partner is murdered and he’s framed for the killing. As it turns out, that’s not the last murder Jim is framed for, as the plot of “Lead Won’t Lie” becomes pretty complicated. 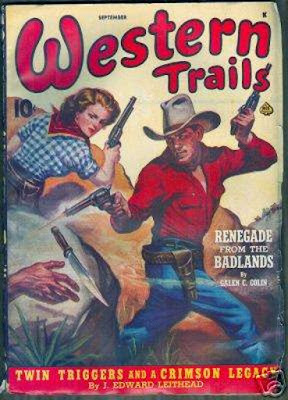 Not Erle Stanley Gardner-complicated, mind you, but still pretty complex for a traditional action Western. Glidden does a good job with that action, too, as Jim Hutchins has to unravel the scheme and expose the real killers in order to save his own hide. This issue wraps up with an 8-page short story by another master of the genre, Gordon D. Shirreffs. “Gun Runners of the Gila” is a fairly early effort from Shirreffs, but it has the great hardboiled action scenes he’s famous for. The plot concerns a man who’s trying to find out who’s responsible for a wagon train massacre in which his brother died. The story feels a little rushed—there’s enough plot to have supported a novelette—but it’s still quite enjoyable. From start to finish, this is a fine issue of TRIPLE WESTERN. If you own a copy or happen to run across one, it’s well worth reading. The cover of this paperback, published by Popular Library in 1952, makes it look like a novel, but it’s not. It’s a collection of ten stories that first appeared in the slick magazine COLLIER’S between 1939 and 1948. After writing prolifically for the pulps for a decade, by the mid-Thirties Ernest Haycox had “graduated” to the slicks, and COLLIER’S was his primary market for the rest of his life. In “End of the Trail”, originally published as “A Young Man’s Fancy” (July 18, 1942), two cowboys are riding south for the winter when they come to a small settlement and one of them has a dangerous idea about how to make some extra money. “On Bakeoven Grade”, from the July 17, 1948 issue of COLLIER’S, is a domestic drama set at a small, isolated ranch that also serves as a stagecoach way station. “Dark Land Waiting” (July 27, 1940) is about a young widow with a small child trying to make a life for the two of them on a homestead on the Great Plains. “Prairie Town”, originally published as “Faithfully, Judith” (April 11, 1942), is a direct sequel to “Dark Land Waiting” even though it was published nearly two years later. This one is about the arrival of the new schoolteacher in the settlement founded in the previous story. “Snow in the Canyon” (January 17, 1948) is a wagon train story in which a group of immigrants tries to make it through a dangerous canyon before they’re trapped there by a sudden snowfall. The protagonist of “The Long Years” (July 15, 1939) is the wife of a cavalry officer who has to deal with the emotional hardships of a life spent in frontier forts. “Skirmish at Dry Fork” (July 25, 1942) is another cavalry story, this time about a clash between troopers and cowboys in a small settlement next to a fort. “Martinet” (October 11, 1941) is my favorite story in this collection. A hard-as-nails, by-the-book cavalry officer returns to active duty at the fort where his former lover is married to another officer. This one’s got enough action and romance to have made a fine film in the 1940s. The collection wraps up with “From the Tuality” (November 6, 1943). I admit, I didn’t know what the Tuality is and never came across it in my years of reading Westerns. Turns out it’s an area in Oregon, and that’s where the protagonist in the story comes from. He’s a farmer, bringing a load of apples to frontier Portland to sell, and he encounters danger and surprises there. Several of these stories are hardly the action-packed Western yarns you’d expect from the cover, but they’re still enjoyable. It took me a while to warm up to Ernest Haycox’s work, but I’ve become a fan. He was a fine writer, and these are all top-notch stories with well-drawn characters. Haycox was never a great action writer, but he could really turn up the heat on his characters. 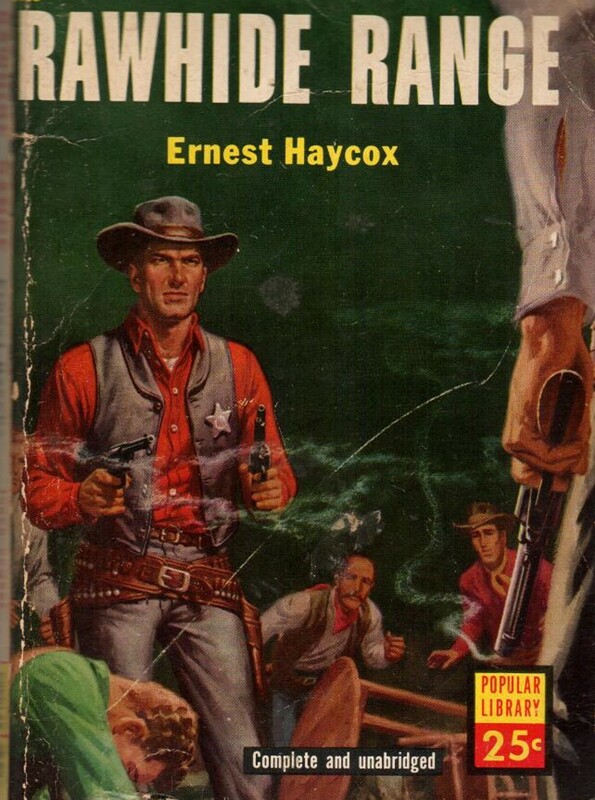 As a sampler of Haycox’s best work in the short story format, you can’t beat RAWHIDE RANGE. 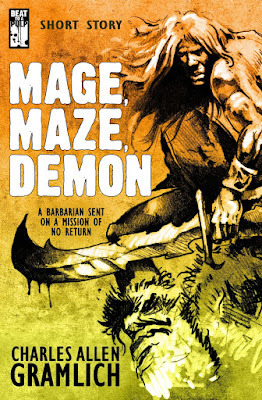 The story “Mage, Maze, Demon” by Charles Allen Gramlich is the latest entry in the Veridical Dreams series, based on the dream journals of Kyle J. Knapp and developed by David Cranmer of Beat to a Pulp. It’s the tale of a barbarian named Bryle, whose help is enlisted by a sinister sorcerer (really, what other kind is there?) to recover a valuable artifact hidden in a maze and guarded by a demon as well as other mystical threats. Don’t think you know everything that’s going to happen once Bryle gets in that maze, though. Gramlich has a few nice plot twists up his sleeve. As you’d expect from a veteran writer and long-time scholar of Robert E. Howard’s work, Gramlich spins a top-notch sword and sorcery yarn. The action races along and comes to a very satisfying conclusion. Bryle is an appealing protagonist, and I’m particularly fond of one of the non-human characters who becomes, in effect, Bryle’s sidekick, even with no dialogue. “Mage, Maze, Demon” is a very entertaining fantasy tale and gets a high recommendation from me. DEFIANCE is based on a true story (though I have no idea how historically accurate it really is) and is an old-fashioned and very good film. There’s a lot of action that’s staged and shot so that you can tell what’s going on, and there are also well-developed characters, a compelling story, and a very satisfying ending. I didn’t even come close to nodding off, which is a rarity for me when I watch a movie. Now, it is almost unrelentingly grim, which you’d expect from the subject matter, but there are a few small touches of humor here and there, as well as the occasional stand-up-and-cheer moment. 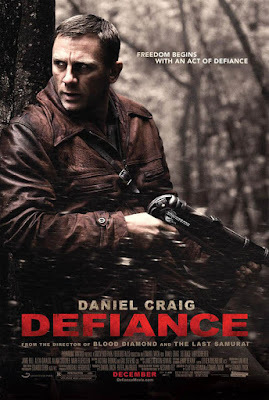 Craig and Schrieber are good as the leads, but really the whole cast is excellent. I wasn’t sure what to expect from this one, but turns out it’s a fine film. Some of you are aware that I've been having eye problems over the past few months, and I finally got in to see the ophthalmologist today after a few insurance snafus. Turns out I may have glaucoma in my right eye. I knew something was going on with it. They did two tests today that turned out inconclusive, and I'm supposed to go back in a couple of weeks for a more definitive test. If it is glaucoma, they've caught it early and it's treatable with eye drops. So the prognosis isn't as good as "Hey, you're fine! ", but it's not too bad. I'm also getting not only new glasses, but some special computer glasses as well to wear just while I'm working. If this will eliminate the frequent headaches where it feels like my skull's fixing to crack open, I'm all for it. If the computer glasses don't help, I may have to try to cut back some more. I'm already spending less time on-line than I used to. I can't cut back on the writing time. He also said that I'm starting to get cataracts, but that I'm years and years away from having to do anything about them. 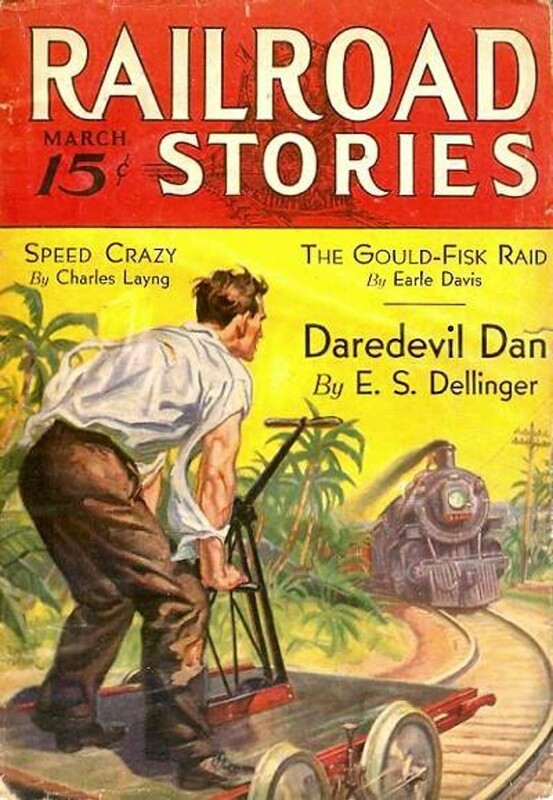 Nice cover on this issue of RAILROAD STORIES, one of the longest-running pulps. The featured story is by E.S. Dellinger, surely the star of the magazine during this era, whose stories appeared in almost every issue. The other authors in this issue are unknown to me with possibly two exceptions. There's a story by A. Leslie, who was definitely Alexander Leslie Scott, the prolific Western pulp author who created two iconic Texas Ranger characters, Jim Hatfield and Walt Slade. And also in the Table of Contents is a story by Alexander Scott, who I'd be willing to bet is the same guy using another pseudonym. (He also published under the names Bradford Scott, Leslie Scott, and Les Scott, that I know of. Maybe more.) 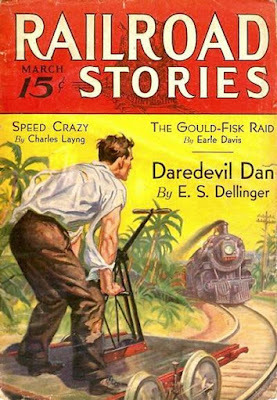 I have a few issues of RAILROAD STORIES, but not this one. I ought to get around to reading them one of these days. If I had all the time in the world, I'd start JAMES REASONER'S WESTERN MAGAZINE and write a new 30-40,000 word novel every month, plus another 20,000 words or so of Western stories by other authors. It would come out in trade paperback and e-book versions. Probably wouldn't sell much, but it would sure be fun. 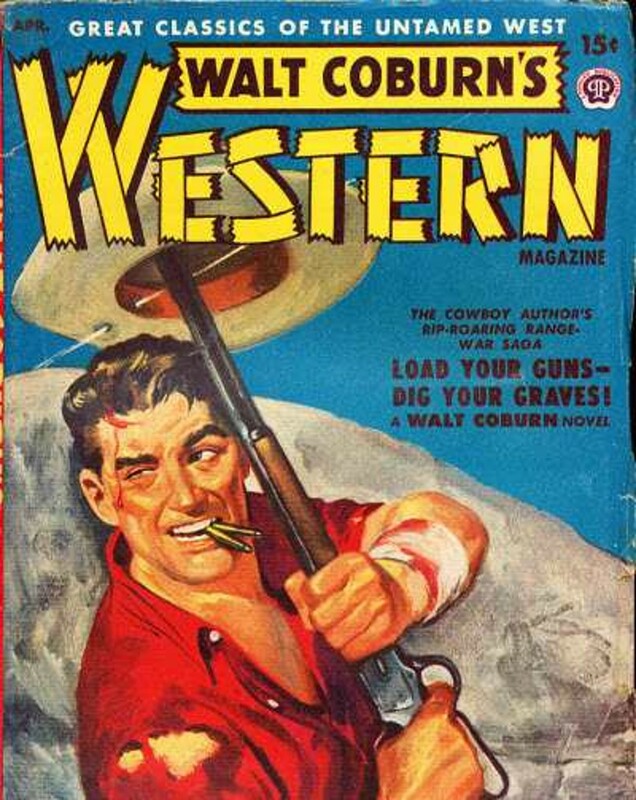 WALT COBURN'S WESTERN MAGAZINE was a reprint pulp, but it had good stories and authors in it. This issue features Walt Coburn, of course, plus Ray Nafziger, Cliff Farrell, Foster-Harris, and Thomas Calvert McClary. And an injury to a hat cover to round things out. If I published JAMES REASONER'S WESTERN MAGAZINE, I could have injury to a hat covers . . .
"Now you're percolatin' on all six cylinders, skipper. Say, you sure spoiled Pasqual for parlor work. Only that I hate to poke a lady in the jaw, I'd have busted that dame so hard she'd sleep a week. Her and that Pasqual guy pulls this Romeo stuff to get your goat, see? Her dolled up in your miss's Sunday-go-to-church rags, lollygaggin' around with this bullfighter bird, makin' chili love under the shelterin' palms. But I bet they don't try to pull no badger game on the next gringo." This is brilliantly goofy stuff, and I don't mean that in a condescending way at all. There's a definite connection between Westerns and the hardboiled detective fiction of the Twenties and Thirties, and this story is another example of it. I have to read more of Coburn's work. Luckily, the large print volume that contains this story, THE SECRET OF CRUTCHER'S CABIN, has two more Coburn short novels in it. I've always liked The Ventures a lot. This song seems pretty appropriate, considering what time it is. Always liked CCR, and this is probably my favorite song by them. Even though this movie is on a DVD set called BILLY THE KID, in addition to being available free in various places on-line, technically it’s not a Billy the Kid movie . . . although it might as well be. 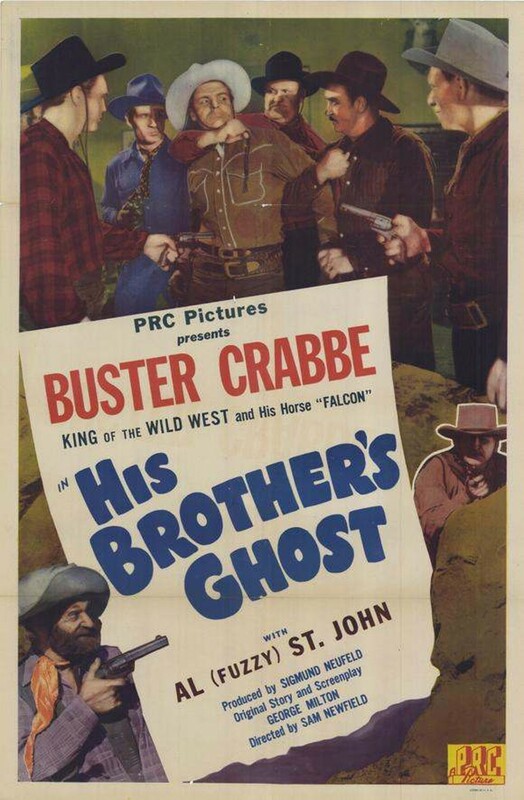 After the series PRC did with Bob Steele and Fuzzy St. John, Buster Crabbe was brought in to play Billy in more than a dozen more of these cheaply and swiftly produced B-Westerns. However, “Billy” wasn’t always Billy the Kid. Sometimes he was just generic cowboy hero Billy Carson, and that’s the case in HIS BROTHER’S GHOST. Most of the movie is pretty much the same, though. Charles King is the bad guy who’s trying to run off all the small ranchers so he can take over. Fuzzy steals the show with his slapstick, cartoonish antics. (Note that I don’t use the words “slapstick” and “cartoonish” in any sort of pejorative manner. I like that stuff.) Buster does a lot of riding around, throws the occasional punch, and shoots the gun out of a bad guy’s hand. Actually, there are a couple of things that do make this entry a little different. When the movie opens, Al St. John is playing a rancher named Andy Jones who falls victim to the raiders. But as he’s dying (a long and drawn-out death scene, by the way, which gives St. John a chance to do some fairly effective dramatic acting), he reveals that he has a twin brother. Billy Carson has the idea of bringing in the brother—who turns out to be Fuzzy Q. Jones, of course—and having him pretend to be his brother’s ghost (hence the title) and spook the villains into overplaying their hand. In the course of this, we learn Fuzzy’s real name: Jonathan. HIS BROTHER’S GHOST is fun, but overall I think I prefer the ones with Bob Steele. His Billy the Kid seems to have more personality than Buster Crabbe’s Billy the Kid/Billy Carson, who’s pretty bland. I’d have to watch more of them to be sure, though. But not right away, I think. As much as I enjoy him, I think I’m about Fuzzied out for now. Like the TV show a lot. Love the theme song. I had all those Ultra Lounge CDs back before the fire and just about wore them out playing them, but I haven't replaced them. It's too easy to listen to music on the Internet these days. 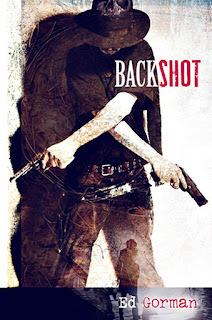 The narrator/protagonist of Ed Gorman’s new novel BACKSHOT is Declan Parnell, a young man who works in a restaurant in the mining town of Granite Bend in 1902. Declan is the sort of guy who has a habit of giving in to temptation, usually with bad results. He gambles and chases women (one woman in particular, the on-again, off-again girlfriend of Declan’s boss) and is generally one step away from wrecking his life. Declan’s boss and the girl he lusts after hatch a robbery scheme, but they need Declan’s help to pull it off. But they’re not telling him everything and things go wrong and Declan discovers that everybody has ugly secrets, even those who appear respectable on the surface. Maybe especially those who appear respectable on the surface. And the price of learning all this may well be Declan’s life. I’m just going to go ahead and say it: Ed Gorman is the best author of Western noir ever. Better than H.A. DeRosso and Lewis B. Patten, and they’re two of my favorites. BACKSHOT is one of his best books, fast and suspenseful and full of sharp-edged, melancholy observations about life. You need to read it. 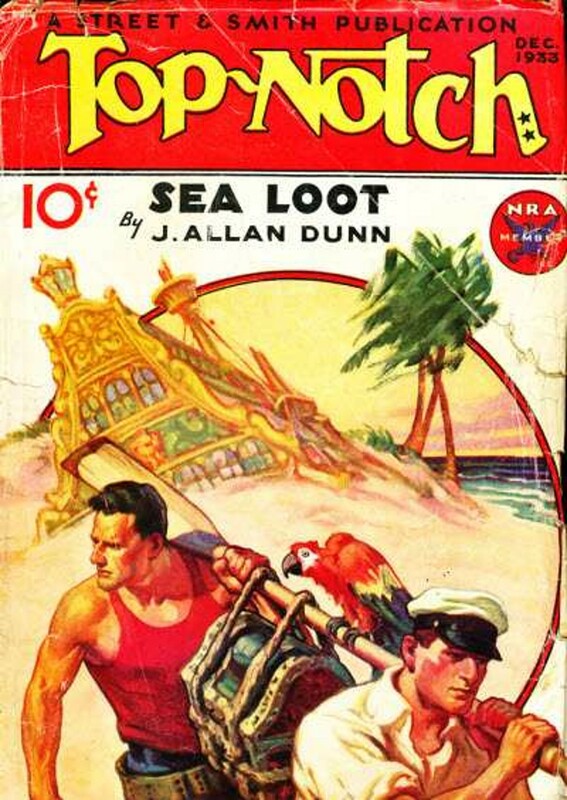 TOP-NOTCH looks like it was a good adventure fiction pulp. I've never read an issue, although I've read a few things that were originally published there. This issue has a nice cover, a novella by J. Allan Dunn, and a novel by Leslie McFarlane that's part of the Snow Hawk series. I never heard of that one, but McFarlane was the actual author of many of the early Hardy Boys novels, so I was a fan of his work when I was a kid without even knowing it. 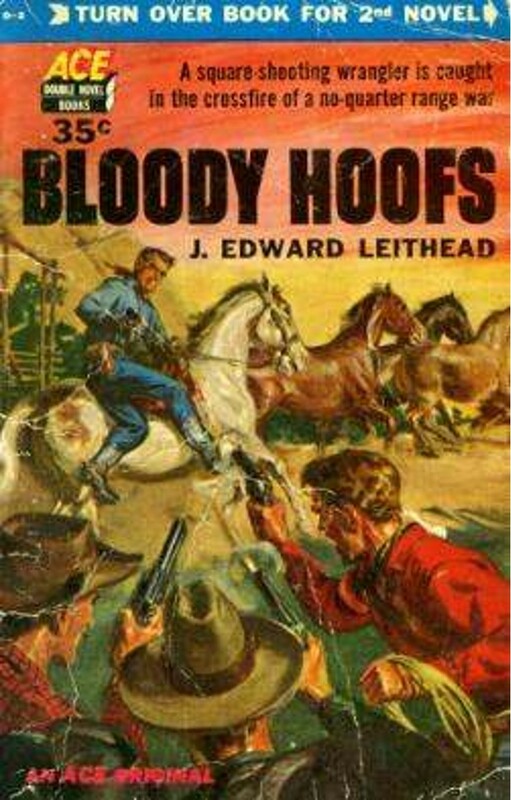 Yesterday's Forgotten Book was a J. Edward Leithead paperback. Here's an issue of WESTERN TRAILS with a Leithead story cover featured, and a fine Norman Saunders cover, to boot! I love the title of the Leithead story: "Twin Triggers and a Crimson Legacy!" He was the most prolific contributor to WESTERN TRAILS and its companion magazine, WESTERN ACES, during the Forties, with at least one story in most issues and often two or three under pseudonyms. Other authors in this issue include L.P. Holmes, Orlando Rigoni (an author I've never read, despite seeing his name around for many, many years), and Ney N. Geer, who wrote quite a bit for WESTERN STORY. 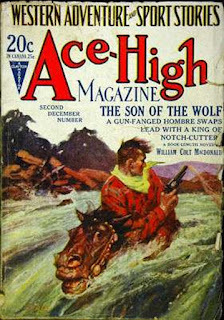 This is Ace Double D-2, the second book in the famous, long-running series of Westerns, mysteries, and science fiction. Despite the fact that the copyright date is 1952 and the cover says "An ACE Original", I suspect it's a reprint of one of Leithead's pulp stories from the Twenties, when his work appeared regularly in ACE-HIGH and other pulps. The style is a little long-winded and formal in places, somewhat different than his work in the Thirties and Forties for RANCH ROMANCES, WESTERN ACES, WESTERN TRAILS, and assorted other Western titles. But it's still a fairly entertaining, fast-moving story. Horse wrangler Bret Kane rides into West Texas carrying a dead man's saddle. The saddle belonged to rancher "One-Shot" Lowrie's prodigal son Bob. Bob Lowrie had become a tinhorn gambler after leaving home, and after being mortally wounded in a fight over a card game, Bob convinced one of the bystanders--Bret Kane--to return his saddle to the old man. What Kane doesn't know is that he is riding into a three-cornered range war between "One-Shot" Lowrie and neighboring ranchers Rufus Overholt and Jim Catlin. That's pretty much the plot of the book. Kane throws in with Lowrie and helps him in his battle to save the Circle O ranch. There's a horse race, some double-crosses, and a lot of shootouts. No romance at all; in fact, the only female characters even mentioned are some anonymous saloon girls. What saves the book for me is Leithead's colorful way with an action scene and the sense that he's enjoying himself. Leithead did better work in some of his other stories, but this one is okay. 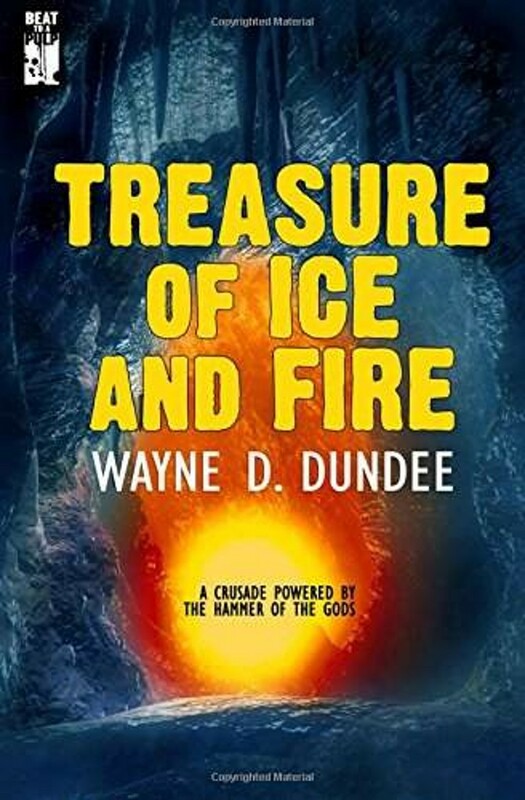 Wayne D. Dundee isn’t just one of the best hardboiled mystery and Western writers around these days. With the release of TREASURE OF ICE AND FIRE, he proves that he can spin a fine sword-and-sorcery yarn as well. Based on concepts created by Kyle J. Knapp and developed by David Cranmer, Dundee’s story takes place in the land of Brassik, which has been conquered and occupied by an invading army from Wyvar. There’s a resistance movement, though, and one of the leading figures is the rogue priest Nindocai, who’s on the trail of a long-lost treasure that may be the key to freeing his land from the invaders and restoring the rightful gods to their places. In order to do that he’ll need help from a blacksmith with what may be a magical hammer, a beautiful huntress, and a young man with an unusual and possibly sinister birthmark. 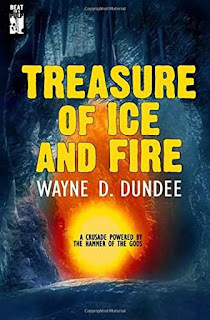 No matter what genre Dundee is working in, the reader is sure to be entertained by his well-drawn and interesting characters, his fast-moving plots, and his great action scenes. All of this is true of TREASURE OF ICE AND FIRE. It’s a thoroughly enjoyable book, and I hope he returns to the land of Brassik for more tales like this in the future. A song that never fails to make me feel better. 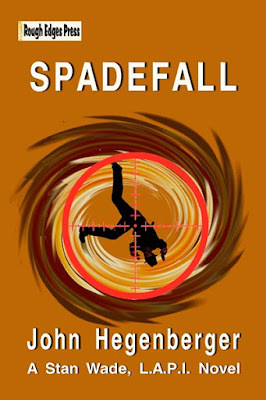 I thought SPYFALL, the first book in John Hegenberger’s series about private detective and reluctant secret agent Stan Wade, was well-written and a lot of fun. The sequel, STARFALL, is even better. Stan takes on occasional jobs for Walt Disney, who in Hegenberger’s slightly alternate take on the 1950s has some sort of shadowy connection with the government. This time kindly old Uncle Walt wants Stan to investigate the mysterious death of a test pilot who’s in the running to become one of the Mercury Seven, America’s first group of astronauts. Stan’s probing of the case takes him to Edwards Air Force Base and also involves him with a bunch of “peacenik” protestors, as well as turning up some unexpected connections to notorious L.A. gangster Mickey Cohen and a fellow private investigator who’s gone missing. Hegenberger clearly has a great time spinning a private eye yarn in the classic mold, with Stan getting hit on the head, taken for a ride, and running around for most of the book wearing a rakish eye patch due to an injury he suffers while battling some bad guys. At the same time there are some darker currents under the breezy, fast-moving surface as Stan struggles with self-doubts and his own history. STARFALL is well-plotted, makes good, accurate use of the era’s history, and is full of interesting characters, both fictional and historical. Most importantly, Stan Wade is a compelling, likable protagonist who has an equally likable circle of friends and associates. STARFALL is just great fun from start to finish, and it gets a high recommendation from me. My favorite jazz guitarist, and an all too appropriate song, although it's the middle of the night, not the day. 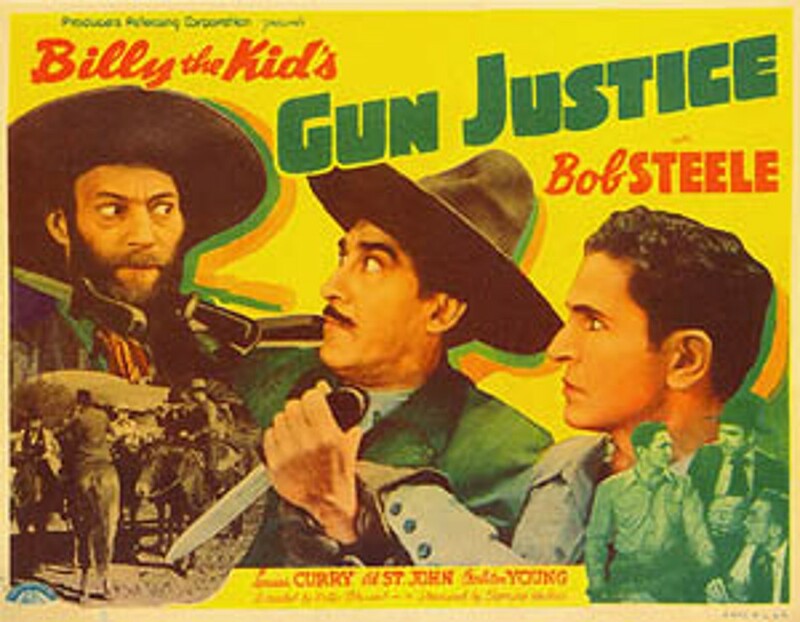 I hadn't watched a B-Western in a long time, so when I had a free hour I took a look at BILLY THE KID'S GUN JUSTICE from 1940, one of six Billy the Kid movies Bob Steele made for the notoriously cheap Producers Releasing Corporation. Sigmund Neufeld was the head of PRC, and most of the movies from them were directed by his brother Sam Newfield, who did this one under the name Peter Stewart. The title doesn't really fit this one, since there's not much gunplay at all. Plenty of fistfights, though, which was pretty common in Bob Steele's movies. The plot is very standard land swindle stuff, but Billy the Kid (who was framed for most of the crimes he's blamed for, according to these movies) settles things with the bad guys by running a con on them, which is sort of a nice change of pace. Bob Steele was an affable, athletic hero at this stage of his career before he spent most of his time playing villains and character parts. You can't help but like his Billy the Kid. His sidekick is Al "Fuzzy" St. John, admittedly an acquired taste, but I like him. And one of the villains is Charles King, who with his portly frame and lounge lizard mustache always seemed like an odd type for a Western henchman to me, but I've got to admit, I enjoy watching his work. BILLY THE KID'S GUN JUSTICE is a really minor film, but I had a pleasant time watching it. The whole thing is available on YouTube if you want to have a look. This always sounds like the theme song from a 1950s movie to me, although I don't think it was. I really like the peaceful sound of it. 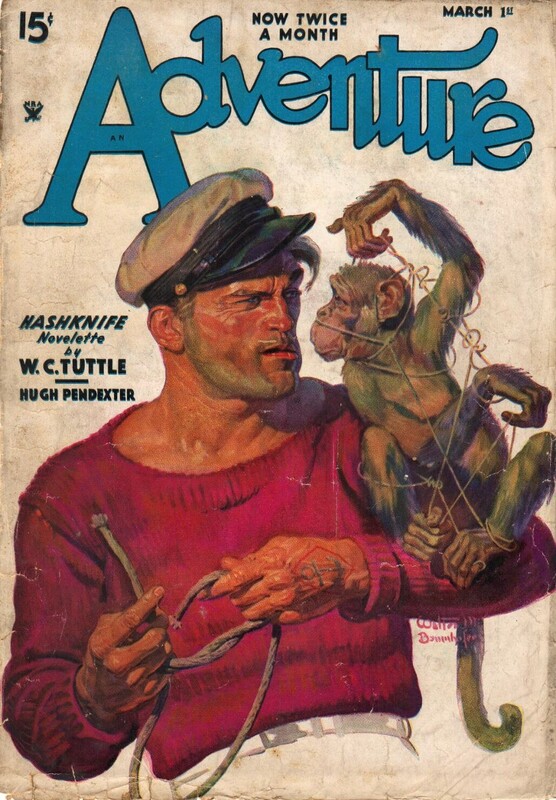 The March 1, 1935 issue of ADVENTURE, which I own thanks to Scott Cupp, starts off with one of the magazine’s most iconic covers, the great sailor-and-monkey cover by Walter Baumhofer. The scan, as usual with pulps that own, is from the actual issue I read. 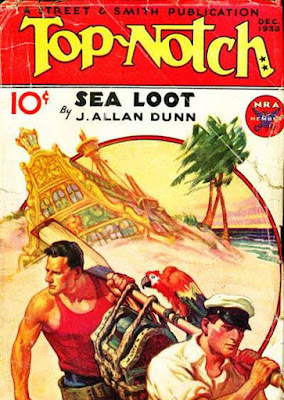 The lead story, which ADVENTURE bills as a novelette but is more like a 40,000 word short novel, is “The Loot of Santana”, a wonderful yarn by one of my favorites, W.C. Tuttle, featuring his best characters, range detectives Hashknife Hartley and Sleepy Stevens. They show up right away in this one (often Tuttle holds off on introducing them until later in the story), and no sooner do they ride onto the page than they discover the body of a murdered cowboy in a corral that’s supposed to hold a herd of horses. The horses are gone, of course, no doubt stolen by the same owlhoots who murdered the cowboy. 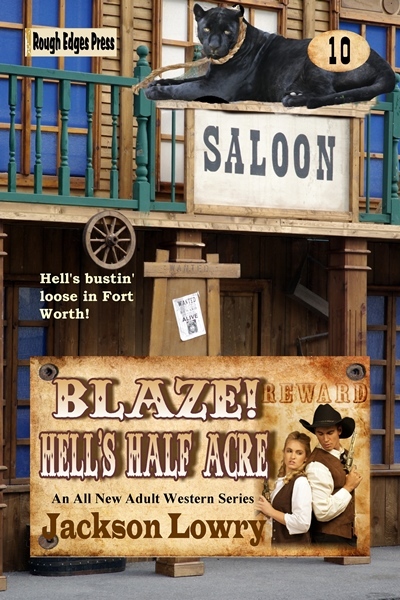 Hashknife can’t pass up a mystery, so he and Sleepy soon find themselves mixed up in a complex plot involving a Romeo-and-Juliet-type of romance, the threat of a sheep empire moving in on a valley full of cattle ranches, a sinister roadhouse below the border, a bank robbery, and several more murders. Nobody can accuse Tuttle of not packing plenty of plot into his stories! When you read enough Hashknife stories they become a little formulaic, but it’s a great formula and nobody ever did it better than Tuttle. I had an absolutely great time reading this one. Sadly, the quality of this issue takes a bit of a nosedive after that. The next two stories are pretty bland. Perry Adams’ “A Contract in Kabul” is about an American and a Scotsman trying to escape from Afghanistan when the Afghans are on the brink of going to war against the English. Maybe Robert E. Howard’s El Borak stories have spoiled me for stuff like this, but Adams’ story never generated much excitement for me. Edgar Piper’s “Down Hell’s Gullet” has a good title, but its plot about a ship’s captain trying to eliminate the use of snuff among his crew didn’t do much for me. There’s other man-against-the-elements stuff going on, but it didn’t hold my interest. Next up is Part 2 of a 4-part serial by Hugh Pendexter, “The Woods-Runner”. It’s probably pretty good, but I generally don’t read serial installments unless I have the whole thing, so I skipped this one. Things take a considerable turn for the better with Eugene Cunningham’s short story “The Red Mare”. Cunningham is best known for his Westerns, of course, but this story is set in 17th Century England and is about a notorious highwayman, an eloping noblewoman, some schemers, and the magnificent horse of the title. Actually, this one would have worked just as well as a Western, but the setting makes for a refreshing difference. Rounding out the issue is “Tyrannical and Capricious Conduct” by Roy Churchill, another nautical story about a tough boatswain’s mate and an incompetent young sailor who turns out to have a secret. It’s not the sort of story that immediately grabs my attention, but the ending is okay. So this issue of ADVENTURE is a bit of a mixed bag: a classic cover, an excellent short novel by Tuttle, a very good story by Cunningham, and the rest of the contents not very impressive (with the caveat that I didn’t read the Pendexter serial installment; it’s probably pretty good, too, given Pendexter’s reputation). It’s certainly an issue worth having for its good points. This is a pulp that I own and read recently, and as usual in those cases, the scan is from the actual issue I read. DIME WESTERN, like all the Popular Publications Western pulps, was a consistently entertaining magazine, and this issue is no exception. Tom W. Blackburn was one of the heroes of my childhood, although I didn’t know that at the time. I say that because he wrote the scripts for the Davy Crockett episodes of THE WONDERFUL WORLD OF DISNEY that featured Fess Parker. There was no bigger fan of Davy Crockett in the early Sixties, when those shows were being rerun on a regular basis, than I was. I sang the theme song all the time, too, and Blackburn wrote those iconic lyrics. In recent years I’ve read some of his pulp stories and liked them. 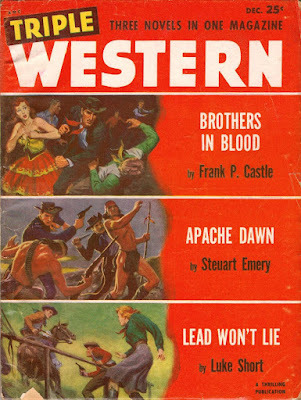 His novelette that leads off this issue, “Quest of the Thirty Dead”, is an excellent hardboiled Western yarn about a bounty hunter tracking down the members of an outlaw gang who raided a town and burned down a hotel as a distraction while they looted the banks, resulting in thirty fatalities. There are a few plot twists and plenty of action in this one, and it comes to a very satisfying conclusion. J.H. Holland is an author I’m not familiar with. His short story, “Get Up and Fight Again!” is next in this issue. It’s set right after the Civil War and concerns a former Union soldier who goes west to find the sister of a friend who died in the Andersonville prison camp. Naturally enough, the sister is having trouble with the local range hog, and the ex-soldier takes up her cause. Holland seems to have been a real person but didn’t publish much. This is the first story of his listed in the Fictionmags Index. It’s fairly well written but never generates much suspense, and the ending seems rushed, as if Holland was too inexperienced to know how to develop the situation. It has some nice bits of action and description, though. Dean Owen’s stories are always good. “A Brave Man Dies But Once”, set in Virginia City, Nevada, during the silver boom, is narrated by traveling cigar salesman Sam Kincaid, who is more than he seems. A crisis forces him to make a choice about which way his life is going to go, and not surprisingly, it all leads to the satisfying conclusion of an excellent tale. By this point in Walt Coburn’s career as a writer and a two-fisted drinker, rumor has it that his manuscripts were heavily rewritten by editors, so it’s impossible to say how much of the novella “Hell With a Running Iron!” is Coburn’s work and how much came from some Popular Publications staffer. Most of it, however, reads like Coburn to me. The plot is fairly simple for one of his yarns—big ranching syndicate frames a small rancher for rustling so it can gobble up his spread—but as usual Coburn has a large cast of characters with a lot of back-story. Sometimes Coburn throws in so many elements his stories don’t really have a chance of making sense, but thankfully that’s not the case here. It’s a good story with some nice action and the undeniable sense of authenticity that you find in most of Coburn’s work. Not in the top rank of his efforts, but for the late Forties, not bad at all. George C. Appell had a nice career writing for the pulps, slicks, and digests from the mid-Forties on through the Sixties, as well as producing a number of novels. His story “Last Roll Call” concerns the aftermath of the Battle of the Little Big Horn and a couple of soldiers from the 7th Cavalry who may have survived the massacre. It’s a good plot, and Appell writes very well. I’ve seen a lot of his work around but haven’t read much of it. Based on this story, I probably should. I started reading Frank Bonham’s juvenile novels when I was a kid, with no knowledge of his career as a writer for the Western pulps. He did a lot of stories with unusual protagonists, and “Payment Past Due” is one of them. The hero is a doctor from the East with a dark secret in his past who heads west to make a new start. Eventually, of course, that secret will come out and the doctor will have to find out if he’s as good with a six-gun as he is with a scalpel. Bonham is another writer whose work is just about always good, and I enjoyed this story quite a bit. Every so often I run across a pulp story written by someone I’ve actually met. That’s the case with Thomas Thompson’s “The Hangin’ Plague Hits Tonto Basin”. Thompson was at the WWA convention in Fort Worth in 1986 and I got to say hello to him there. I don’t remember much about it except that he was pleasant enough and looked a lot like the actor Al Lewis, who played Grandpa Munster. He was the story editor on BONANZA for many years, so I was a fan of his work there, but I’m not sure I’ve ever read any of his pulp stories before this one. I’ll definitely be looking for them from now on, though, because “The Hangin’ Plague Hits Tonto Basin” is maybe the best story in this issue of DIME WESTERN. It’s a variation on the old sheepmen-versus-local-cattle-baron plot, with an ex-con caught in the middle, but it’s very well written with a great hardboiled tone and plenty of action. I really enjoyed it and want to read more by Thompson, soon. That wraps up this issue of DIME WESTERN, and it’s a very good one, with only one weak story (and it’s not terrible) and the others ranging from good to excellent. That’s not surprising, given DIME WESTERN’s consistent quality. If you have any issues or come across some, chances are they’ll be well worth reading. Anyway, while I’ve seen a bunch of the movies based on MacDonald’s work, I’ve never actually read much of it, one novel that I recall and a few pulp stories. 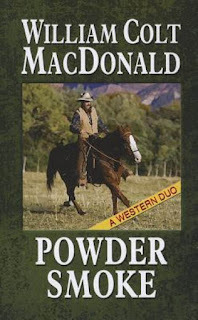 I’m starting to regret that I haven’t sampled his stories more extensively, because I recently read POWDER SMOKE, a Leisure paperback reprinting a couple of MacDonald’s pulp novellas, and I thoroughly enjoyed it. The first story, “The Son of the Wolf”, was published originally in the December 17, 1927 issue of ACE-HIGH MAGAZINE, which at that stage of its existence was still a general fiction pulp before evolving into an all-Western pulp. The Wolf is ruthless cattle baron and range hog Wolf Blaine, who runs roughshod over all the other ranchers in the area, forcing them out so he can take over their spreads through legal means . . . but if that doesn’t work, Blaine isn’t above goading a man into a gunfight, killing him, and claiming self-defense. He makes so many enemies that one of them decides to strike back by kidnapping Blaine’s infant son and raising him to be an outlaw. I read this right after Lewis B. Patten’s PURSUIT, where there’s hardly any good in anybody, and it was really a refreshing change. Yeah, “The Son of the Wolf” is old-fashioned and hokey and even a little melodramatic, but dang, I had fun reading it. MacDonald keeps things moving along at a fast pace, and the ending is a little tragic but mostly heartwarming. I don’t know about you, but my heart needs a little warming now and then. 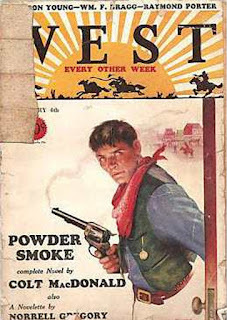 “Powder Smoke”, the second short novel in this volume, originally appeared in the February 4, 1931 issue of WEST. It’s a more traditional Western yarn, with bad guys trying to take over a ranch by crooked means, including framing a young cowboy for the murder of his own brother. Getting to the bottom of this is rancher Powder Smoke Peters, who seems to have been pretty heavily influenced by W.C. Tuttle’s Hashknife Hartley in name as well as actions. 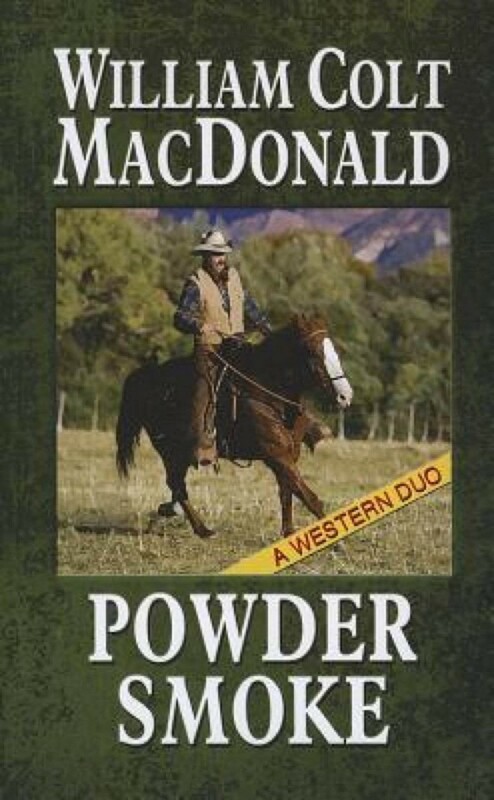 Powder Smoke sets out to solve the mystery, which appears pretty obvious on the surface, but MacDonald manages to throw in a nice twist or two along the way. This blend of mystery, gunplay, and humor is very reminiscent of Tuttle and is also highly entertaining. I really enjoyed both novellas in this collection. They’re very traditional and old-fashioned, but then again, so am I at times, and they’re executed with a high degree of skill. If you’re a fan of pulp Western yarns, I give POWDER SMOKE a high recommendation. It's still available in Kindle and large print editions, and used copies of the Leisure paperback are inexpensive and plentiful. The Robert E. Howard Foundation has announced the nominees for its annual awards honoring the best Howard scholarship of the previous year. 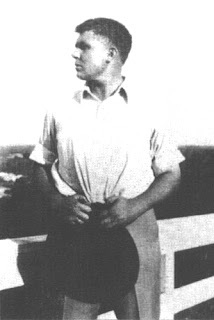 I was surprised--and very, very pleased, proud, and honored--to find my essay "Not Your Ordinary Gun-Dummy: The Western Heroes of Robert E. Howard" among them. It's nominated in the Hyrkanian category, for Outstanding Achievement - Essay (Print). This essay was published in REH: Two-Gun Raconteur #18. The awards will be presented in Cross Plains on June 10, during the annual Howard Days festivities. This is incredibly gratifying to me. I've been a Howard fan for almost 50 years, ever since I picked up a copy of the Lancer edition of CONAN THE USURPER in Barber's Bookstore in downtown Fort Worth. (I could show you the building and probably come pretty close to pointing out the spot where the rack stood that held that copy.) I've been involved with Howard fandom for more than 20 years, having attended my first Howard Days in 1995 and joining the Robert E. Howard United Press Association, better known as REHupa, shortly thereafter. I've written several introductions to collections of Howard's stories and contributed the occasional article to various publications. However, I've always considered myself more of a reader and fan than a scholar and have approached most of my writing about Howard that way. Mostly I've had fun (the way I try to approach most things) and it makes me feel great to know that my fellow Howard fans think this essay is worthwhile. Now, it's up against some stiff competition, mind you. The other nominees are Dierk Guenther's “A Farewell to the Old West – The End of the “Old Frontier”—Robert E. Howard’s ‘Old Garfield’s Heart’”, which also appeared in REH: Two-Gun Raconteur #18, and Jeffrey Shanks' “Evolutionary Otherness: Anthropological Anxiety in Robert E. Howard’s ‘Worms of the Earth’”, which appeared in THE UNIQUE LEGACY OF WEIRD TALES. I fully expect one of those guys to walk off with the award, and well-deserved it will be. But there really is a lot of truth to that old saying about it being an honor just to be nominated. My sincere thanks to the Robert E. Howard Foundation and everyone who participates in these awards.